We are pleased to announce that ForeFlight Mobile version 6.8 is now available for download on the App Store! This update focuses on improving airport surface operations with more taxi chart coverage and more information on taxi charts for improved guidance. A new ownship setting makes compliance easy for customers operating under the guidance of FAA AC 120-76C. Version 6.8 also moves the app to a new minimum level of iOS support, paving the way to better product efficiency and more feature capability in the future. Taxiing to the FBO just got easier—over 2700 FBO locations are now mapped on both FAA and ForeFlight Airport Diagrams for better ground-based taxi guidance. When coupled with ownship display capability in ForeFlight Mobile Pro, you can easily see where your aircraft is in relation to the FBO. We continue to add more FBO markers with each Business Directory update. 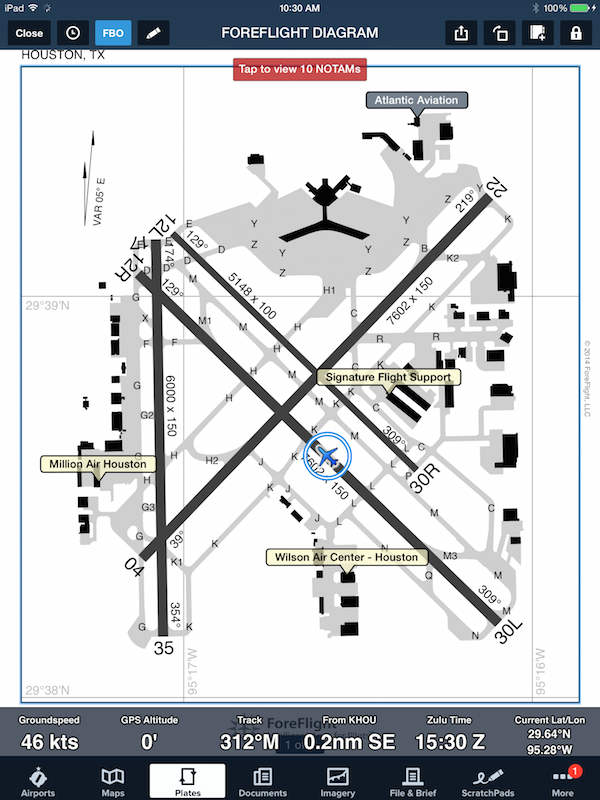 FBO markers shown on the airport diagram for Houston’s Hobby Airport. While viewing a taxi chart, tap on any FBO marker to see detailed information, including photos, fuel prices, contact information, and more. FBO markers will appear on taxi charts within the Plates view and also when displaying a taxi chart on top of the moving map. Tap on the FBO marker to reveal detailed location information. Turn FBO overlay on or off in the Plates view. Turn FBO overlay on or off in the Maps view. If you are an FBO and would like to place your marker, login to your ForeFlight Manage account or contact directory@foreflight.com to set up an account. 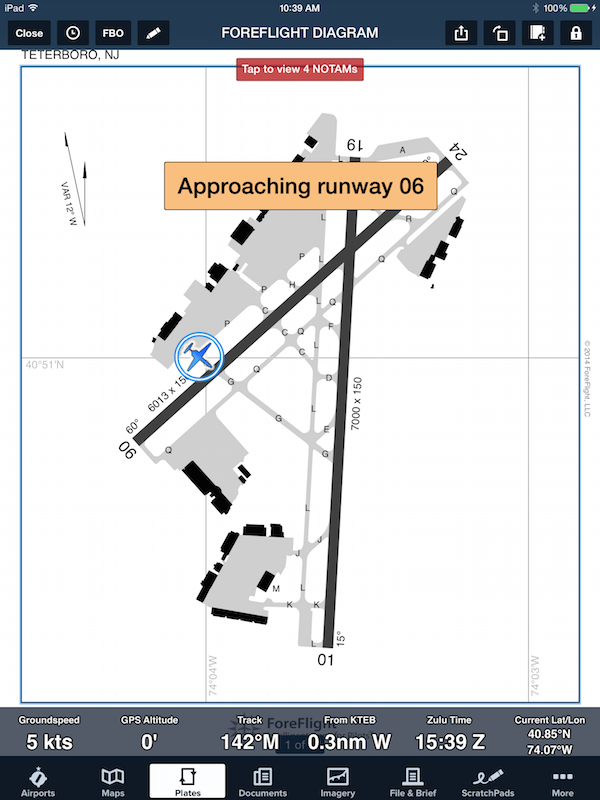 FBOs on Airport Diagrams is available to Basic and Pro subscribers; ownship position on geo-referenced airport diagrams is a Pro feature. 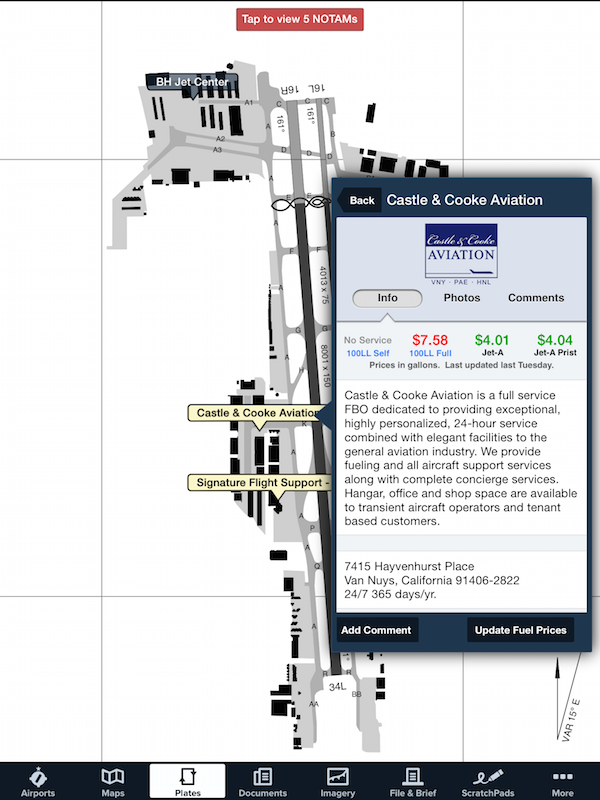 We continue to invest in expanding our taxi chart coverage, providing taxi charts for airports not mapped by the FAA. As of this release, we have added more than 1,700 ForeFlight taxi charts—more than tripling the coverage provided by the FAA alone! 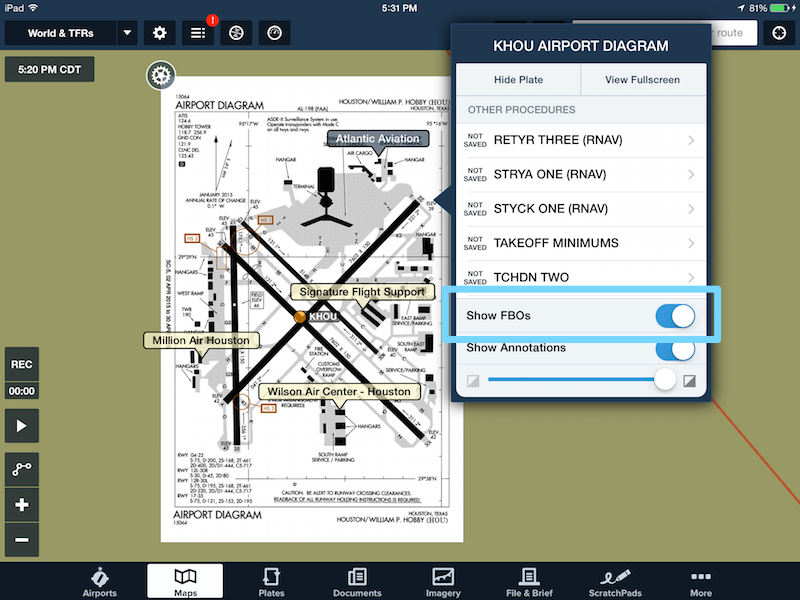 Our airport mapping team continues to expand ForeFlight’s library, giving you more coverage at more airports. Combined with the new FBO display on taxi charts, finding FBOs at airports is easier than ever. Approval for ownship display on airport diagrams is a huge safety enhancement for Part 135 and 121 operators. ForeFlight now makes it easier for our certificated FAA Part 91F, 91K, 121, 125 and 135 customers to comply with ownship display limitations as defined in FAA AC 120-76C operational guidance for use of electronic flight bags. These operators are limited to using ownship depiction during airport surface operations and at less than 80 knots ground speed. 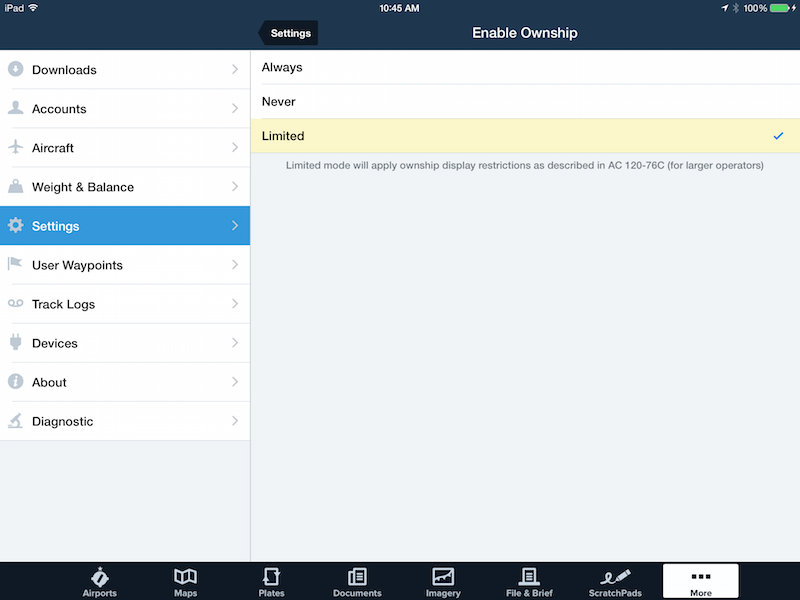 To access the setting, navigate to the More > Settings view, then scroll down to Preferences and tap on Enable Ownship. The ownship setting options include: Always, Never, and Limited. Limited mode automatically applies the speed-restricted display function as described in the Advisory Circular. Once airborne, the ownship display icon is automatically removed from view. New ‘Limited’ ownship setting makes it easy to comply with FAA AC-120-76C guidance. If your flight operation is not taking advantage of ownship display on taxi diagrams, we have the tools and resources to help you get going. Email sales@foreflight.com for more information. 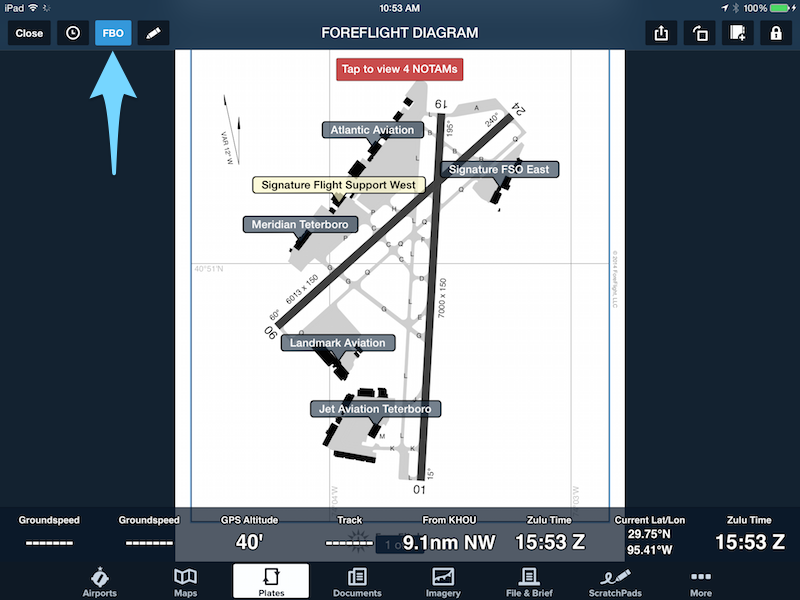 Please note that ForeFlight Mobile 6.8 requires iOS 8 or higher. By moving to iOS 8 as the minimum supported iOS version, we can deliver new features enabled by the Apple update, deliver smaller application downloads, improve energy efficiency, improve support for devices like the iPhone 6 Plus, and deliver faster application performance. If you would like to take advantage of the new features in ForeFlight Mobile 6.8 or later, you will first need to update your device to the current iOS 8.x version. Apple posted this helpful article with instructions on how to update your iOS device to iOS 8. For those of you running Apple iOS 7.x or earlier versions, you will still be able to use your current version of ForeFlight Mobile. After ForeFlight Mobile 6.8 is released, if you need to reinstall ForeFlight on an existing device you can download the last compatible version of ForeFlight Mobile from the App Store. If you have any questions, please contact us at team@foreflight.com. The only device that is not capable of upgrading to iOS 8 that is currently also supported by iOS 7 (the current minimum iOS requirement for ForeFlight Mobile) is iPhone 4. This entry was posted in 2015 ForeFlight Year in Review, Software Updates and tagged aviation, foreflight, iPad, ownship, taxi chart by ForeFlight. Bookmark the permalink.